Ordinary thermostats read the temperature in just one room (usually the hallway). That can make things uncomfortable in important rooms like your bedroom. That’s why ecobee3 was created. It works with room sensors to deliver the right temperature to the rooms that matter most. Are you reading in bed or watching the game downstairs? 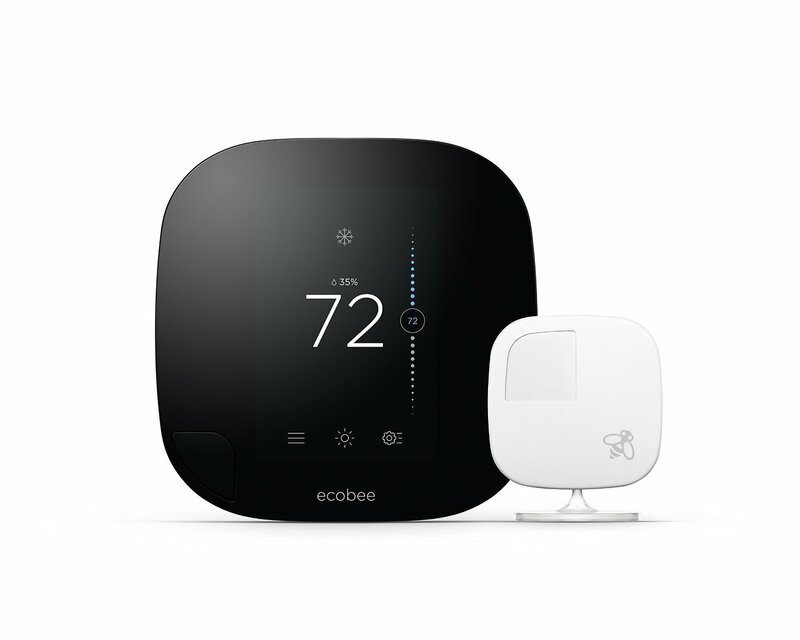 ecobee3 knows and delivers comfort to the right place at the right time. The sensors also know when a room is empty. Unoccupied rooms can be automatically deprioritized, for increased energy savings. It’s simply a smarter, better system. Works with Apple Home Kit, Amazon Echo, Samsung SmartThings, IFTTT, Wink and more. – Heat pump (4H/2C) incl. 2-stage auxiliary heat. Working well for me so far. It comes pre-programmed with 3 settings, but you can add more “comfort settings” for different activities if you’d like. Fantastic product! This is by far the best thermostat I’ve ever had and very satisfied with it. When I was looking for a smart thermostat my biggest gripe was the the temperature regulated was only from one room. For those, like me, who live in a bigger house this is a major problem. As such the external sensors are a life saver! They can keep track of the whole house and make the temperature as even as possible. It doesn’t have to track for phone to change the temperature if you’re not there! call me old fashion but I think it was weird that all these thermostats had to track my phone to find out if I was away for not. What if I had guests over and had to leave for a while? The extra sensors solve this by tracking motion in front of them. So even if you’re schedule to be ‘away’ but someone is there it won’t leave them in the cold. The app is really nice and with the sensors I think adds much more than other thermostats could. All the settings and profiles can change dynamically with how active other sensors are in the home. So even if we’re all supposed to be in ‘sleep-mode’ it won’t ignore someone downstairs watching tv in the living room. 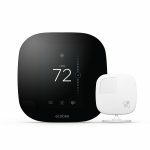 There is so much to this product it’s unreal and would highly recommend it to anyone looking for a smart thermostat! I love that the Ecobee works with my Alexa. It makes everything so much easier when all our “smart” technology can work together. 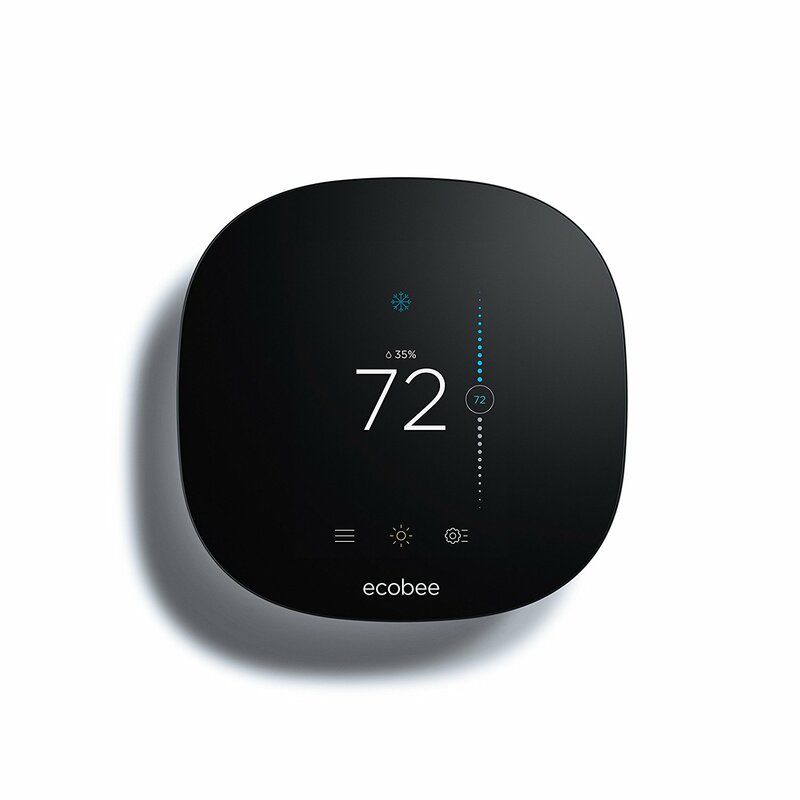 The Ecobee 3 is so much easier than our old thermostat and I really think we’ve saved a lot of time as well as money with this investment. Would recommend! We’ve had our Ecobee3 for just over a year now and I don’t think we could go without it at this point. It makes life so much easier… it’s so hands off. I still adjust the temperature by hand from time to time, but there’s almost no need now that we have all of our settings just right. And we save so much on electricity, since we don’t have it running all day while we’re at work. A great product.